Cuba has a planned economy dominated by state-run enterprises. Most industries are owned and operated by the government and most of the labor force is employed by the state. Following the fall of the Soviet Union, the Communist Party encouraged the formation of worker co-operatives and self-employment. In the year 2000, public sector employment was 76% and private sector employment, mainly composed of self-employment, was 23% compared to the 1981 ratio of 91% to 8%. Investment is restricted and requires approval by the government. The government sets most prices and rations goods to citizens. In 2016, Cuba ranked 68th out of 182 countries with a Human Development Index of 0.775, much higher than its GDP per capita rank (95th). In 2012, the country's public debt was 35.3% of GDP, inflation (CDP) was 5.5%, and GDP growth was 3%. Housing and transportation costs are low. Cubans receive government subsidized education, health care and food subsidies. The country achieved a more even distribution of income since the Cuban Revolution, which was followed by an economic embargo by the United States. Following the collapse of the Soviet Union, Cuba's GDP declined by 33% between 1990 and 1993, partially due to loss of Soviet subsidies and to a crash in sugar prices in the early 1990s. Cuba retains high levels of healthcare and education. 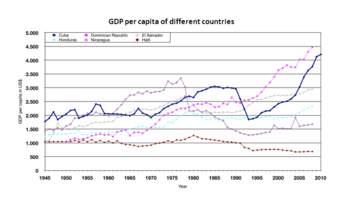 Although Cuba belonged to the high-income countries of Latin America since the 1870s, income inequality was high, accompanied by capital outflows to foreign investors. The country's economy had grown rapidly in the early part of the century, fueled by the sale of sugar to the United States. Prior to the Cuban Revolution, Cuba ranked fifth in the hemisphere in per capita income, third in life expectancy, second in per capita ownership of automobiles and telephones, first in the number of television sets per inhabitant. Its income per capita in 1929 was reportedly 41% of the U.S., thus higher than in Mississippi and South Carolina. Its proximity to the United States made it a familiar holiday destination for wealthy Americans. Their visits for gambling, horse racing and golfing made tourism an important economic sector. Tourism magazine Cabaret Quarterly described Havana as "a mistress of pleasure, the lush and opulent goddess of delights." According to Perez, "Havana was then what Las Vegas has become." Cuban dictator Fulgencio Batista had plans to line the Malecon, Havana's famous walkway by the water, with hotels and casinos to attract even more tourists. Today Hotel Havana Riviera is the only hotel that was built before the revolutionary government took control. Cuba had a one-crop economy (sugar cane) whose domestic market was constricted. Its population was characterized by chronic unemployment and deep poverty. United States monopolies like Bethlehem Steel Corporation and Speyer gained control over valuable national resources. The banks and the country's entire financial system, all electric power production and the majority of industry was dominated by U.S. companies. U.S. monopolies owned 25 percent of the best land in Cuba. More than 80 percent of farmland was owned by sugar and livestock-raising large landowners. 90 percent of the country's raw sugar and tobacco exports was exported to the U.S. In 1956, U.S.-owned companies controlled "90 percent of the telephone and electric services, about 50 percent in public service railways, and roughly 40 percent in raw sugar production" according to a report published by the Department of Commerce . The gains from these investments were reaped by American businessmen leading to discontent among the Cuban people. In the 1950s, most Cuban children were not in school. 87 percent of urban homes had electricity, but only 10 percent of rural homes did. Only 15 percent of rural homes had running water. Nearly half the rural population was illiterate as was about 25 percent of the total population. Poverty and unemployment in rural areas triggered migration to Havana. More than 40 percent of the Cuban workforce in 1958 were either underemployed or unemployed. Public Education in Cuba has always been free. After passing the required entrance examination to your particular course of study, even attendance at the University of Havana was tuition free, except for the cost of books. After the Cuban Revolution, the new government placed the reconstruction of the education system along Marxist ideological lines as a top priority. On March 3, 1959, Fidel Castro seized control of the Cuban Telephone Company, which was a subsidiary of the International Telephone and Telecommunications Corporation. This was the first of many nationalizations made by the new government, the assets seized totaled US$9 billion. After the 1959 Revolution, citizens were not required to pay a personal income tax (their salaries being regarded as net of any taxes). The government also began to subsidize healthcare and education for all citizens; this action created strong national support for the new revolutionary government. After the USSR and Cuba reestablished their diplomatic relations in May 1960, the USSR began to buy Cuban sugar in exchange for oil. When oil refineries like, Shell, Texaco, and Esso refused to refine Soviet oil, Castro nationalized that industry as well, taking over the refineries on the island. Days later in response, the United States cut the Cuban Sugar Quota completely, Eisenhower was quoted saying "This action amounts to economic sanctions against, Cuba. Now we must look ahead to other moves - economic, diplomatic, and strategic". On February 7, 1962, Kennedy expanded the United States' embargo to cover almost all U.S. imports. In 1970, Fidel Castro attempted to motivate the Cuban people to harvest 10 million tons of sugar, in Spanish known as La Zafra, in order to increase their exports and grow their economy. With the help of the majority of the Cuban population the country was able to produce 7.56 million tons of sugar. In July 1970, after the harvest was over, Castro took responsibility for the failure and later that same year he blamed the Sugar Industry Minister saying “Those technocrats, geniuses, super-scientists assured me that they knew what to do in order to produce the ten million tons. But it was proven, first, that they did not know how to do it and, second, that they exploited the rest of the economy by receiving large amounts of resources . . . while there are factories that could have improved with a better distribution of those resources that were allocated to the Ten-Million-Ton plan”. During the Revolutionary period Cuba was one of the few developing countries to provide foreign aid to other countries. Foreign aid began with the construction of six hospitals in Peru in the early 1970s. It expanded later in the 1970s to the point where some 8000 Cubans worked in overseas assignments. Cubans built housing, roads, airports, schools and other facilities in Angola, Ethiopia, Laos, Guinea, Tanzania and other countries. By the end of 1985, 35,000 Cuban workers had helped build projects in some 20 Asian, African and Latin American countries. For Nicaragua in 1982, Cuba pledged to provide over $130 million worth of agricultural and machinery equipment, as well as some 4000 technicians, doctors and teachers. In 1986 Cuba defaulted on its $10.9 billion debt to the Paris Club. In 1987 Cuba stopped making payments on that debt. In 2002 Cuba defaulted on $750 million in Japanese loans. Although the Soviet Union offered subsidies to Cuba beginning shortly after the Revolution, comparative economic data from 1989 showed that the amount of Soviet aid was in line with the amount of Western aid to other Latin American countries. The Cuban gross domestic product declined at least 35% between 1989 and 1993 due to the loss of 80% of its trading partners[clarification needed] and Soviet subsidies. This loss of subsidies coincided with a collapse in world sugar prices. Sugar had done well from 1985–90 and crashed precipitously in 1990–91 and did not recover for five years. Cuba had been insulated from world sugar prices by Soviet price guarantees. However, the Cuban economy began to boost again following a rapid improvement in trade and diplomatic relations between Cuba and Venezuela following the election of Hugo Chávez in Venezuela in 1998, who became Cuba's most important trading partner and diplomatic ally. This era was referred to as the "Special Period in Peacetime" later shortened to "Special Period". A Canadian Medical Association Journal paper claimed that "The famine in Cuba during the Special Period was caused by political and economic factors similar to the ones that caused a famine in North Korea in the mid-1990s, on the grounds that both countries were run by authoritarian regimes that denied ordinary people the food to which they were entitled to when the public food distribution collapsed and priority was given to the elite classes and the military." Other reports painted an equally dismal picture, describing Cubans having to resort to eating anything they could find, from Havana Zoo animals to domestic cats. But although the collapse of centrally planned economies in the Soviet Union and other countries of the Eastern bloc subjected Cuba to severe economic difficulties, which led to a drop in calories per day from 3052 in 1989 to 2600 in 2006, mortality rates were not strongly affected thanks to the priority given on maintaining a social safety net. The government undertook several reforms to stem excess liquidity, increase labor incentives and alleviate serious shortages of food, consumer goods and services. To alleviate the economic crisis, the government introduced a few market-oriented reforms including opening to tourism, allowing foreign investment, legalizing the U.S. dollar and authorizing self-employment for some 150 occupations. (This policy was later partially reversed, so that while the U.S. dollar is no longer accepted in businesses, it remains legal for Cubans to hold the currency.) These measures resulted in modest economic growth. The liberalized agricultural markets introduced in October 1994, at which state and private farmers sell above-quota production at free market prices, broadened legal consumption alternatives and reduced black market prices. Government efforts to lower subsidies to unprofitable enterprises and to shrink the money supply caused the semi-official exchange rate for the Cuban peso to move from a peak of 120 to the dollar in the summer of 1994 to 21 to the dollar by year-end 1999. The drop in GDP apparently halted in 1994, when Cuba reported 0.7% growth, followed by increases of 2.5% in 1995 and 7.8% in 1996. Growth slowed again in 1997 and 1998 to 2.5% and 1.2% respectively. One of the key reasons given was the failure to notice that sugar production had become uneconomic. Reflecting on the Special period Cuban president Fidel Castro later admitted that many mistakes had been made, "The country had many economists and it is not my intention to criticize them, but I would like to ask why we hadn’t discovered earlier that maintaining our levels of sugar production would be impossible. The Soviet Union had collapsed, oil was costing $40 a barrel, sugar prices were at basement levels, so why did we not rationalize the industry?" Living conditions in 1999 remained well below the 1989 level. However, from 1996, the State started to impose income taxes on self-employed Cubans. Cuba ranked third in the region in 1958 in GDP per capita, surpassed only by Venezuela and Uruguay. It had descended to 9th, 11th or 12th place in the region by 2007. Cuban social indicators suffered less. Every year the United Nation holds a vote asking countries to choose if the United States is justified in their economic embargo against Cuba and whether it should be lifted. 2016 was the first year that the United States abstained from the vote, rather than voting no, "since 1992 the US and Israel have constantly voted against the resolution – occasionally supported by the Marshall Islands, Palau, Uzbekistan, Albania and Romania". Either we change course or we sink. In 2011, "The new economic reforms were introduced, effectively creating a new economic system, referred by some as the "New Cuban Economy" Since then, over four hundred thousand Cubans have signed up to be entrepreneurs. As of 2012, the government lists 181 official jobs no longer under their control—such as taxi driver, construction worker and shopkeeper. Workers may purchase licenses to work as a mule driver, palm tree trimmer, well-digger, button covered and "dandy"—gentleman in traditional elegant white suit and hat. Despite these openings Cuba maintains nationalized companies for the distribution of all essential amenities (water, power, ...) and other essential services to ensure a healthy population (education, health care). Imports were double exports and doctors earned £15 per month. Families supplement incomes with extra jobs. After 2000, half the country's sugar mills closed and tourists now ride factory steam locomotives. More than 150,000 farmers lease land from the government for bonus crops. Before, home-owners were allowed to swap properties; legalized buying and selling then created a real-estate boom. In 2012 a Havana fast-food burger pizza restaurant, La Pachanga, started in the owner's home, serves 1,000 meals on a Saturday at £3, the weekly government wage. In 2008, Raúl Castro's administration hinted that the purchase of computers, DVD players and microwaves would become legal. [needs update] However, monthly wages remain less than 20 U.S. dollars. Mobile phones, which had been restricted to Cubans working for foreign companies and government officials, were legalized in 2008. In 2010, Fidel Castro, in agreement with Raúl Castro's reformist sentiment, admitted that the Cuban model based on the old Soviet model of centralized planning was no longer sustainable. They encouraged the creation of a co-operative variant of socialism where the state plays a less active role in the economy and the formation of worker-owned co-operatives and self-employment enterprises. Change in the structure of employment; reduce inflated payrolls and increase work in the non-state sector. On December 20, 2011 a new credit policy allowed Cuban banks to finance entrepreneurs and individuals wishing to make major purchases to do home improvements in addition to farmers. "Cuban banks have long provided loans to farm cooperatives, they have offered credit to new recipients of farmland in usufruct since 2008 and in 2011 they began making loans to individuals for business and other purposes". The system of rationed food distribution in Cuba was known as the Libreta de Abastecimiento ("Supplies booklet"). As of 2012 ration books at bodegas still procured rice, oil, sugar and matches, above government average wage £15 monthly. Raul Castro signed Law 313 in September 2013 in order to create a special economic zone in the port city of Mariel, the first in the country. On 22 October 2013 the dual currency system was set to be ended eventually. As of 2018, the dual currency was still being used in Cuba. As of August 2012, off-shore petroleum exploration of promising formations in the Gulf of Mexico had been unproductive with two failures reported. Additional exploration is planned. In 2007, Cuba produced an estimated 16.89 billion kWh of electricity and consumed 13.93 billion kWh with no exports or imports. In a 1998 estimate, 89.52% of its energy production is fossil fuel, 0.65% is hydroelectric and 9.83% is other production. In both 2007 and 2008 estimates, the country produced 62,100 bbl/d of oil and consumes 176,000 bbl/d with 104,800 bbl/d of imports, as well as 197,300,000 bbl proved reserves of oil. Venezuela is Cuba's primary source of oil. In 2008, Cuba produced and consumed an estimated 400 million cu m of natural gas, with no cu m of exports or imports and 70.79 billion cu m of proved reserves. The Energy Revolution is a program executed by Cuba in 2006. This program focused on developing the country's socio-economic status and transition Cuba into an energy-efficient economy with diverse energy resources. Cuba's energy sector lacks the resources to produce optimal amounts of power. In fact, one of the issues the Energy Revolution program faces comes from Cuba's power production suffering from the absence of investment and the ongoing trade sanctions imposed by the United States. Likewise, the energy sector has received a multimillion-dollar investment distributed among a network of power resources. However, customers are experiencing rolling blackouts of power from energy companies in order to preserve electricity during Cuba's economic crisis. Furthermore, an outdated electricity grid that's been damaged by hard hitting hurricanes, caused the energy crisis in 2004 and continued to be a major issue during the Energy Revolution. Cuba responded to this situation by providing a variety of different types of energy resources. In fact, 6000 small diesel generators, 416 Fuel Oil Generators, 893 diesel generators, 9.4 million incandescent bulbs for energy saving lamps, 1.33 million fans, 5.5 million electric pressure cookers, 3.4 million electric rice cookers, 0.2 million electric water pumps, 2.04 million domestic refrigerators and 0.1 million televisions were distributed among territories. The electrical grid was restored to only 90% until 2009. Alternative energy has emerged as a major priority as the government has promoted wind and solar power. The crucial challenge the Energy Revolution program will face is developing sustainable energy in Cuba but, take into account a country that's continuing to develop, an economic sanction and the detrimental effects of hurricanes that hit this country. Cuba produces sugarcane, tobacco, citrus, coffee, rice, potatoes, beans and livestock. As of 2015 Cuba imported about 70–80% of its food. and 80–84% of the food it rations to the public. Raúl Castro ridiculed the bureaucracy that shackled the agriculture sector. In total, industrial production accounted for almost 37% of Cuban GDP, or US$6.9 billion and employed 24% of the population, or 2,671,000 people, in 1996. A rally in sugar prices in 2009 stimulated investment and development of sugar processing. In 2003 Cuba's biotechnology and pharmaceutical industry was gaining in importance. Among the products sold internationally are vaccines against various viral and bacterial pathogens. For example, the drug Heberprot-P was developed as a cure for diabetic foot ulcer and had success in many developing countries. Cuba has also done pioneering work on the development of drugs for cancer treatment. Scientists such as V. Verez-Bencomo were awarded international prizes for their contributions in biotechnology and sugar cane. In the mid-1990s tourism surpassed sugar, long the mainstay of the Cuban economy, as the primary source of foreign exchange. Havana devotes significant resources to building tourist facilities and renovating historic structures. Cuban officials estimate roughly 1.6 million tourists visited Cuba in 1999 yielding about $1.9 billion in gross revenues. In 2000, 1,773,986 foreign visitors arrived in Cuba. Revenue from tourism reached US$1.7 billion. By 2012, some 3 million visitors brought nearly £2 billion yearly. The growth of tourism has had social and economic repercussions. This led to speculation of the emergence of a two-tier economy and the fostering of a state of tourist apartheid. This situation was exacerbated by the influx of dollars during the 1990s, potentially creating a dual economy based on the dollar (the currency of tourists) on the one hand and the peso on the other. Scarce imported goods – and even some of local manufacture, such as rum and coffee – could be had at dollar-only stores, but were hard to find or unavailable at peso prices. As a result, Cubans who earned only in the peso economy, outside the tourist sector, were at a disadvantage. Those with dollar incomes based upon the service industry began to live more comfortably. This widened the gulf between Cubans' material standards of living, in conflict with the Cuban Government's long term socialist policies. Cuba has a small retail sector. A few large shopping centers operated in Havana as of September 2012 but charged US prices. Pre-Revolutionary commercial districts were largely shut down. The majority of stores are small dollar stores, bodegas, agro-mercados (farmers' markets) and street stands. The financial sector remains heavily regulated and access to credit for entrepreneurial activity is seriously impeded by the shallowness of the financial market. The Netherlands receives the largest share of Cuban exports (24%), 70 to 80% of which go through Indiana Finance BV, a company owned by the Van 't Wout family, who have close personal ties with Fidel Castro. Currently, this trend can be seen in other colonial Caribbean communities who have direct political ties with the global economy. Cuba's primary import partner is Venezuela. The second largest trade partner is Canada, with a 22% share of the Cuban export market. Cuba began courting foreign investment in the Special Period. Foreign investors must form joint ventures with the Cuban government. The sole exception to this rule are Venezuelans, who are allowed to hold 100% ownership in businesses due to an agreement between Cuba and Venezuela. Cuban officials said in early 1998 that 332 joint ventures had begun. Many of these are loans or contracts for management, supplies, or services normally not considered equity investment in Western economies. Investors are constrained by the U.S.-Cuban Liberty and Democratic Solidarity Act that provides sanctions for those who traffic in property expropriated from U.S. citizens. Cuba's average tariff rate is 10 percent. The country's planned economy deters foreign trade and investment. The state maintains strict capital and exchange controls. Cuba has two official currencies, both of which are called peso. One is sometimes called the "national currency" (or CUP) the other is the convertible peso (or CUC, often called "dollar" in the spoken language). There are currently 25 CUP per CUC. In 1994 the possession and use of US dollars was legalised, and by 2004 the US dollar was in widespread use in the country. To capture the hard currency flowing into the island through tourism and remittances – estimated at $500–800 million annually – the government set up state-run "dollar stores" throughout Cuba that sold "luxury" food, household and clothing items, compared with basic necessities, which could be bought using national pesos. As such, the standard of living diverged between those who had access to dollars and those without. Jobs that could earn dollar salaries or tips from foreign businesses and tourists became highly desirable. It was common to meet doctors, engineers, scientists and other professionals working in restaurants or as taxicab drivers. However, in response to stricter economic sanctions by the US and because the authorities were pleased with Cuba's economic recovery, the Cuban government decided in October 2004 to remove US dollars from circulation. In its place, the convertible peso was created, which although not internationally traded, has a value pegged to the US dollar 1:1. A 10% surcharge is levied for cash conversions from US dollars to the convertible peso, which does not apply to other currencies, so it acts as an encouragement for tourists to bring currencies such as Euros, pounds sterling or Canadian dollars into Cuba. An increasing number of tourist zones accept Euros. Owners of small private restaurants (paladares) originally could seat no more than 12 people and can only employ family members. Set monthly fees must be paid regardless of income earned and frequent inspections yield stiff fines when any of the many self-employment regulations are violated. As of 2012, more than 150,000 farmers had signed up to lease land from the government for bonus crops. Before, home-owners were only allowed to swap; once buying and selling were allowed, prices rose. In cities, "urban agriculture" farms small parcels. Growing organopónicos (organic gardens) in the private sector has been attractive to city-dwelling small producers who sell their products where they produce them, avoiding taxes and enjoying a measure of government help from the Ministry of Agriculture (MINAGRI) in the form of seed houses and advisers. Typical wages range from 400 non-convertible Cuban pesos a month, for a factory worker, to 700 per month for a doctor, or a range of around 17–30 US dollars per month. However, the Human Development Index of Cuba still ranks much higher than the vast majority of Latin American nations. After Cuba lost Soviet subsidies in 1991, malnutrition resulted in an outbreak of diseases. Despite this, the poverty level reported by the government is one of the lowest in the developing world, ranking 6th out of 108 countries, 4th in Latin America and 48th among all countries. Pensions are among the smallest in the Americas at $9.50/month. In 2009, Raúl Castro increased minimum pensions by 2 dollars, which he said was to recompense for those who have "dedicated a great part of their lives to working... and who remain firm in defense of socialism". La Bodega – For Cuban nationals only. Redeems coupons for rice, sugar, oil, matches and sells other foodstuffs including rum. La Coppelia – A government-owned facility offering ice cream, juice and sweets. Paladar – A type of small, privately owned restaurant facility. La Farmacia – Low-priced medicine, with the lowest costs anywhere in the world. ETECSA – National telephone service provider. La Feria – A weekly market (Sunday market-type) owned by the government. Cervecería Bucanero – A beverage manufacturer, providing both alcoholic and non-alcoholic beverages. Ciego Montero – The main soft-drink and beverage distributor. The relationship cultivated between Cuba and Venezuela in recent years resulted in agreements in which Venezuela provides cheap oil in exchange for Cuban "missions" of doctors to bolster the Venezuelan health care system. Cuba has the second-highest per capita number of physicians in the world (behind Italy). The country sends tens of thousands of doctors to other countries as aid, as well as to obtain favorable trade terms. In nominal terms, the Venezuelan subsidy is higher than whatever subsidy the Soviet Union gave to Cuba, with the Cuban state receiving cheap oil and the Cuban economy receiving around $6 billion annually. According to Mesa-Lago, a Cuban-born US economist. "If this help stops, industry is paralysed, transportation is paralysed and you'll see the effects in everything from electricity to sugar mills," he said. From an economic standpoint, Cuba relies much more on Venezuela than Venezuela does on Cuba. As of 2012, Venezuela accounted for 20.8% of Cuba's GDP while Cuba only accounted for roughly 4% of Venezuela's. Because of this reliance, the most recent economic Crisis in Venezuela (2012-present), with inflation nearing 800% and GDP shrinking by 19% in 2016, Cuba is not receiving their amount of payment and heavily subsidized oil. Further budget cuts are in the plans for 2018 marking a third straight year. In 2014 Cuba's economic freedom score was 28.7, making its economy one of the world's least free. Its overall score was 0.2 point higher than last year, with deteriorations in trade freedom, fiscal freedom, monetary freedom and freedom from corruption counterbalanced by an improvement in business freedom. Cuba ranked least free of 29 countries in the South and Central America/Caribbean region and its overall score was significantly lower than the regional average. Over the 20-year history of the Index, Cuba's economic freedom remained stagnant near the bottom of the “repressed” category. Its overall score improvement was less than 1 point over the past two decades, with score gains in fiscal freedom and freedom from corruption offset by double-digit declines in business freedom and investment freedom. Despite some progress in restructuring the state sector since 2010, the private sector remained constrained by heavy regulations and tight state controls. The Heritage Foundation states that open-market policies were not in place to spur growth in trade and investment and the lack of competition continued to stifle dynamic economic expansion. A watered-down reform package endorsed by the Party trimmed the number of state workers and expanded the list of approved professions, but many details of the reform remained obscure. As of 2009, Cuba had $47.08 billion in revenues and $50.34 billion in expenditures with 34.6% of GDP in public debt, an account balance of $513 million and $4.647 billion in reserves of foreign exchange and gold. Government spending is around 67 percent of GDP and public debt is around 35 percent of the domestic economy. Despite reforms, the government continues to play a large role in the economy. The top individual income tax rate is 50 percent. The top corporate tax rate is 30 percent (35 percent for wholly foreign-owned companies). Other taxes include a tax on property transfers and a sales tax. The overall tax burden is 24.4 percent of GDP. ^ "The World Factbook — Central Intelligence Agency". Cia.gov. Retrieved 23 August 2018. ^ a b c d e f g h i j k l m n "The World Factbook". Cia.gov. Retrieved 11 June 2015. ^ a b "Export Partners of Cuba". CIA World Factbook. 2012. Retrieved 26 July 2013. ^ a b "Import Partners of Cuba". CIA World Factbook. 2012. Retrieved 26 July 2013. ^ "Cuba Economic Freedom Score" (PDF). Heritage. Retrieved 1 May 2014. ^ Upside Down World. "Talking with Cubans about the State of the Nation (3/5/04)". Upsidedownworld.org. Retrieved 11 June 2015. ^ Ritter, Archibald R.M. (9 May 2004). the Cuban Economy. University of Pittsburgh Pre. ISBN 978-0-8229-7079-8. ^ Baten, Jörg (2016). A History of the Global Economy. From 1500 to the Present. Cambridge University Press. p. 137. ISBN 9781107507180. ^ "American Experience – Fidel Castro". PBS. Retrieved 11 June 2015. ^ Marianne Ward (Loyola College) and John Devereux (Queens College CUNY), The Road not taken: Pre-Revolutionary Cuban Living Standards in Comparative Perspective Archived 2012-12-17 at the Wayback Machine pp. 30–31. ^ a b Natasha Geiling. "Before the Revolution". Smithsonian. Retrieved 11 June 2015. ^ Freeman, Belmont (2014-12-01). "History of the Present: Havana". Places Journal (2014). doi:10.22269/141201. ^ "Cuba Before the Revolution". Jacobinmag.com. Retrieved 23 August 2018. ^ "John F. Kennedy: Speech of Senator John F. Kennedy, Cincinnati, Ohio, Democratic Dinner". Presidency.ucsb.edu. Retrieved 23 August 2018. ^ Monzote, Reinaldo Funes (2016-03-03). "Sugar Cane and Agricultural Transformations in Cuba". doi:10.1093/acrefore/9780199366439.001.0001/acrefore-9780199366439-e-4. ^ Johnson, Leland L. (1965-01-01). "U.S. Business Interests in Cuba and the Rise of Castro". World Politics. 17 (3): 440–459. doi:10.2307/2009288. JSTOR 2009288. ^ Gjelten, Tom (2008). Bacardi and the Long Fight for Cuba: The Biography of a Cause. Viking. pp. 170–. ISBN 978-0-670-01978-6. Retrieved 21 January 2017. ^ Brenner, Philip (2008). A Contemporary Cuba Reader: Reinventing the Revolution. Rowman & Littlefield. pp. 8–. ISBN 978-0-7425-5507-5. Retrieved 21 January 2017. ^ "Cuba After Castro: Can Exiles Reclaim Their Stake?". TIME.com. 5 August 2006. Retrieved 11 June 2015. ^ a b New York Times (November 1995). "Well-to-Do in Cuba to Pay an Income Tax". The New York Times. Retrieved 29 January 2007. ^ a b FRANKLIN, JANE, ed. (2016-01-01). Cuba and the U.S. Empire. A Chronological History. NYU Press. pp. 24–33. ISBN 9781583676066. JSTOR j.ctt1b3h9jn.8. ^ Hannah, A. C.; Spence, Donald (1997-07-17). The International Sugar Trade. John Wiley & Sons. ISBN 9780471190547. ^ "How Castro Failed - Commentary Magazine". Commentary Magazine. Retrieved 2017-03-29. ^ a b c "CUBA TODAY". Multinationalmonitor.org. Retrieved 11 June 2015. ^ "Investor's Business Daily". Investor's Business Daily. Retrieved 6 March 2016. ^ "Cuba's Revolutionary Economy". multinationalmonitor.org. April 1989. Retrieved 6 March 2016. Soviet aid to Cuba in per capita terms or as a share of national income is in line with the amount of Western aid to many Latin American countries. ^ John Pike. "Cuba's Economy". Globalsecurity.org. Retrieved 11 June 2015. ^ "Health Consequences of Cuba's Special Period". Canadian Medical Association Journal. 29 July 2008. ^ "Parrot diplomacy". The Economist. 24 July 2008. ^ "Cuba's Organic Revolution". TreeHugger. Retrieved 11 June 2015. ^ Inc, IBP (2015-01-26). Cuba Investment, Trade Laws and Regulations Handbook Volume 1 Strategic Information and Basic Laws. Lulu.com. ISBN 9781433075698. ^ Pérez-López, Jorge F (2006). "The Cuban Economy in 2005–2006: The End of the Special Period?". Cuba in Transition. 16: 1–13. ^ "Challenges 2007–2008: Cuban Economy in Need of Nourishment". Archived from the original on 4 December 2010. Retrieved 11 June 2015. ^ "US to abstain from UN vote condemning Cuba embargo for the first time in 25 years". The Telegraph. Retrieved 2017-03-29. ^ Voss, Michael (16 April 2011). "A last hurrah for Cuba's communist rulers". BBC News. Retrieved 14 July 2012. ^ "Cuba adopta nuevos lineamientos económicos para aumentar la producción". Semanarioaqui.com. Retrieved 11 June 2015. ^ a b c d "BBC 2012 Simon Reeve documentary". Retrieved 23 September 2013. ^ "BBC Simon Reeve 2012 documentary". YouTube. Retrieved 23 September 2013. ^ a b "Cell phones, microwaves: New access to gizmos could deflect calls for deeper change in Cuba". International Herald Tribune. 28 March 2008. ^ Stephen Wilkinson (10 September 2010). "Cuba: from communist to co-operative?". The Guardian. London. ^ Domínguez, Jorge I. (2012). Cuban Economic and Social Development: Policy Reforms and Challenges in the 21st Century. Harvard University Press. ISBN 978-0-674-06243-6. ^ Perez Villanueva, Omar Evernly; Pavel Vidal Alejandro (2010). "Cuban Perspectives on Cuban Socialism". The Journal of the Research on Socialism and Democracy". 24 (1). ^ Philip, Peters (23 May 2012). "A Viewers Guide to Cuba's Economic Reforms". Lexington Institute: 21. ^ Chris Arsenault. "Cuba to open tax free Special Economic Zone". Aljazeera.com. Retrieved 11 June 2015. ^ "Cuba to scrap two-currency system in latest reform". BBC News. 22 October 2013. Retrieved 24 October 2013. ^ "La Revolucion Energetica: Cuba's Energy Revolution", Renewable Energy World International Magazine, 9 April 2009. ^ "2nd Cuban offshore oil well also a bust". The Guardian. Havana. AP Foreign. 6 August 2012. Retrieved 6 August 2012. ^ a b Arrastía-Avila, Mario Alberto; Glidden, Lisa (2017). "CUBA'S ENERGY REVOLUTION AND 2030 POLICY GOALS: MORE PENETRATION OF RENEWABLE ENERGY IN ELECTRICITY GENERATION". The International Journal of Cuban Studies. 9 (1): 73–90. doi:10.13169/intejcubastud.9.1.0073. ^ a b Newman, Nicholas (2009). "Decentralized energy aids Cuba's power struggles". Power Engineering International. 17 (11): 16–19. ^ a b Surez, Jos; Beatn, Pedro; Escalona, Ronoldy; Montero, Ofelia (2012). "Energy, environment and development in Cuba". Renewable and Sustainable Energy Reviews. 16 (5): 2724–2731. doi:10.1016/j.rser.2012.02.023. ^ Cherni, Judith; Hill, Yohan (2009). "Energy and policy providing for sustainable rural livelihoods in remote locations – The case of Cuba". Geoforum. 40 (4): 645–654. doi:10.1016/j.geoforum.2009.04.001. ^ "WFP Cuba page". Wfp.org. ^ a b "Cuban leader looks to boost food production". Cnn.com. 17 April 2008. ^ "Truly revolutionary". The Economist. 29 November 2003. ^ "Ecuadorians benefit from Cuban drug Heberprot-p". Radio Havana Cuba. 12 August 2012. Archived from the original on 31 May 2013. Retrieved 8 September 2012. ^ ""Cuba's Cancer Revolution" from The Documentary Podcast by BBC on Apple Podcasts". Apple Podcasts. Retrieved 23 August 2018. ^ Inc, IBP (2016-04-18). Cuba Business and Investment Opportunities Yearbook Volume 1 Strategic, Practical Information and Opportunities. Lulu.com. ISBN 9781438776552. ^ Gorry, C (2007). "Dr vicente vérez bencomo, director, center for the study of synthetic antigens, university of havana". MEDICC Rev. 9: 14–15. PMID 21487355. ^ "Tourism, travel, and recreation – Cuba". Mationsencyclopedia.com. Retrieved 11 June 2015. ^ "Cuba". Nationsencyclopedia.com. Retrieved 11 June 2015. ^ "Cuba (11/03)". U.S. Department of State. Retrieved 2017-02-22. ^ a b c d "2014 Index of Economic Freedom". Heritage.org. The Heritage Foundation. Retrieved 24 November 2014. ^ P. J. O'Rourke (1 December 2007). Eat the Rich: A Treatise on Economics. Grove/Atlantic, Incorporated. ISBN 978-1-55584-710-4. ^ "Cuba – The comandante's last move". The Economist. 21 February 2008. ^ Efrén Córdova. "The situation of Cuban workers during the "Special Period in peacetime"" (PDF). Archived from the original (PDF) on 2009-03-18. ^ "Raul Castro raises state pension". BBC. 27 April 2008. Retrieved 3 January 2010. ^ Tamayo, Juan O. "How will the Venezuela-Cuba link fare after Chávez's death?". miamiherald. Retrieved 6 March 2016. ^ Jeremy Morgan. "Venezuela's Chávez Fills $9.4 Billion Yearly Post-Soviet Gap in Cuba's Accounts". Latin American Herald Tribune. Retrieved 6 March 2016. ^ "As Hugo Chavez fights for his life, Cuba fears for its future". Telegraph.co.uk. Retrieved 6 March 2016. ^ Piccone,Ted and Harold Trinkunas "The Cuba-Venezuela Alliance: The Beginning of the End?" Latin America Initiative on Foreign Policy at Brookings (2014): 1-12..
^ Frank, Marc. "Cuba warns of further belt tightening as Venezuelan crisis deepens." Reuters. N.p., 28 Apr. 2017. Web. Cuba in Transition: Volume 19. Cave, Danien. Raúl Castro Thanks U.S., but Reaffirms Communist Rule in Cuba (December 2014), The New York Times. "Mr. Castro prioritized economics. He acknowledged that Cuban state workers needed better salaries and said Cuba would accelerate economic changes in the coming year, including an end to its dual-currency system. But he said the changes needed to be gradual to create a system of "prosperous and sustainable communism." Tourism in Cuba is an industry that generates over 4.5 million arrivals in 2017, and is one of the main sources of revenue for the island. With its favorable climate, beaches, colonial architecture and distinct cultural history, Cuba has long been an attractive destination for tourists. "Cuba treasures 253 protected areas, 257 national monuments, 7 UNESCO World Heritage Sites, 7 Natural Biosphere Reserves and 13 Fauna Refuge among other non-tourist zones." Cuban–Chinese relations are the interstate relations between the People's Republic of China and Republic of Cuba, which are both communist states. The origins of the relations began when the Qing dynasty established a consulate in Havana while Cuba was a still a colony of Spain in 1879. In 1902, the Qing recognized the independence of the Republic of Cuba from the United States. After the establishment of diplomatic ties with the Soviet Union after the Cuban Revolution of 1959, Cuba became increasingly dependent on Soviet markets and military aid, becoming an ally of the Soviet Union during the Cold War. In 1972 Cuba joined the COMECON, an economic organization of states designed to create cooperation among the socialist planned economies dominated by the large economy of the Soviet Union. Moscow kept in regular contact with Havana, sharing varying close relations until the collapse of the bloc in 1991. After the demise of the Soviet Union, Cuba entered an era of economic hardship known as the Special Period in Time of Peace. The Cuba Oil Union (Spanish: Unión Cuba-Petróleo) or CUPET is Cuba's largest oil company. It is owned and operated by the Cuban national government. The company is involved in the extraction of petroleum deposits as well as the refining and distributing of petroleum products. In conjunction with the conglomerate Cimex, it operates a chain of filling stations selling gasoline in convertible pesos. Cuban economic reforms refer to macroeconomic policies implemented with the aim at stabilising the Cuban economy after 1993. They were initially enacted to offset the economic imbalances which resulted from the dissolution of the Soviet Union in 1991. The reforms focused heavily on the macroeconomic stabilization of the Cuban economy. This was to achieved through a reduction in fiscal deficit, and through structural changes such as the enactment of the Free Farmer's Market agreement, the legalization of self-employment, and the decriminalization of the United States dollar. The economic reforms resulted in a decrease in inflation, appreciation of the Peso, increase in output and productivity, and in an improvement in the fiscal deficit.